Most elementary school students are counting down the days until the last day of school. They’re certainly not thinking about what to be when they grow up. Wilfrid Laurier University’s Junior University Multidisciplinary Program (JUMP) aims to change this. JUMP is a hands-on camp program for students in grades 5 to 8. The camp, celebrating its 25th anniversary next year, will host nearly 2,000 students at Laurier’s Waterloo campus during May and June. JUMP is an interdisciplinary program where students experience just how exciting postsecondary learning can be. Students take part in hands-on educational courses and activities they may not experience in their everyday classrooms, including exercise programming and experiments in science labs. During the one-, two-, or three-day camp experience, students enjoy meals from the dining hall and see campus facilities up close. In his 15th year bringing students to JUMP, Forest Glen Public School teacher Tim Sitts reflects about his experience with the program. JUMP helps emphasize postsecondary and career readiness at an early age, while also promoting a culture where all students are encouraged to aim high. 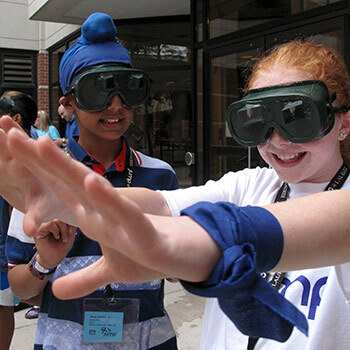 "JUMP is a true ‘camp’ experience and a fun way to experience postsecondary life as a preteen, providing hands-on learning experience suitable for all levels of learners." This spring, 921 grade 7 students from the Avon Maitland School Board attended JUMP for a one-day program. “JUMP is a great opportunity for students to be exposed to postsecondary education early, so they can make informed choices for course selections in their senior high school years and get a sense of possible career pathways,” says Dennis Meuller, pathways project lead at the Avon Maitland School Board. When curiosity is encouraged and students are immersed in a real-world university experience, their confidence and aspiration to pursue postsecondary education is boosted. “The JUMP theatre course is fantastic. It’s always instructed by talented and enthusiastic Laurier students, whose passion enriches every student’s JUMP experience. In this setting, I have seen students suddenly try things and take risks that they wouldn't in a school setting,” says Sitts. In May, JUMP also welcomed classes from two Waterloo Region schools from the JumpStart to Higher Education program. Laurier’s JumpStart program brings resources and information about university to elementary school students in high-risk areas. This is the fifth year that students from the JumpStart program attended JUMP. JUMP lives up to the Golden Hawk spirit. Participants are assigned to a colour team and participate in a cheer-off and dance. “The cheer-off and dance both add value to the student's experience. The energy and hands-on involvement of the JUMP staff makes for an exciting opportunity for our students to engage, respect and learn from a university-age mentor,” says Sitts. JUMP, which runs until June 27, is led by Laurier Conference Services along with several academic and campus departments to ensure the success of the program. For more information about JUMP contact Isabeau Glebe at jump@wlu.ca or 519.884.0710 x3958.